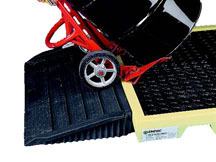 Low-profile spill pallets to catch drips and leaks - creating a safe work environment. Optimize warehouse space with these low-profile Workstations taht actually become part of the factory floor for increased safety and efficiency. Catch incidental spills with a large sump capacity. Easy cleaning with heavy-duty removable structural foam grates. This item is oversized and must ship with a LTL freight company. Freight quotes are estimates only and do not include fuel surcharges that change daily. Acual rate may vary.